As one of the most predictable occurrences on the planet, the science behind tides still remains a mystery to many. The natural rising and falling of water on shore every day is a result of the gravitational pull of the sun on earth, as well as the pull of the moon on our planet. Every 27 days, the moon makes a complete revolution around earth and this is also the length of a tidal cycle. The position of the moon relative to the earth dictates the strength of the tidal cycle. Image from NOAA. The Northeast, like many coastal areas in the world, experiences two distinct high and low tides each day. Depending on both the phase of the moon and the changing distance between the moon and earth, these tide cycles might be more noticeable at certain times during the month. When the moon is full or new, the sun and moon are lined up and the gravitational pull is combined. When this happens, they are called spring tides, which make high tides higher than usual and low tides lower than normal. The powerful combination of a storm tide in addition to storm surge is shown here. Image from NOAA. When a strong storm moves towards land, the phrase “storm surge” is often discussed and can catch many living in coastal areas by surprise. Water pushed by wind towards shore during powerful weather events is known as storm surge. This combined with astronomical high tides can lead to significant flooding in coastal areas along the Northeast. 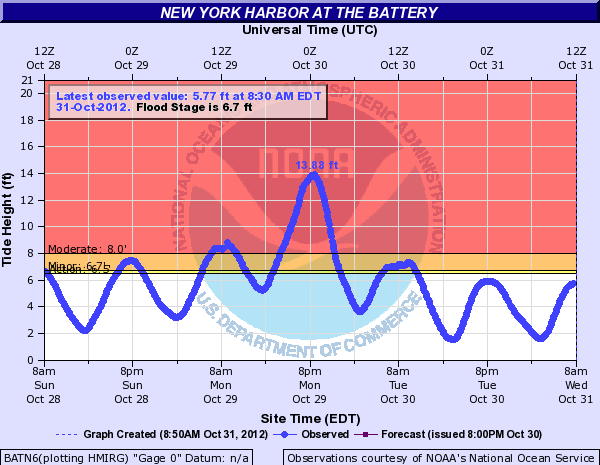 During Superstorm Sandy in October of 2012, an astronomical high tide coincided with a 9-foot storm surge in the New York City area and created a record tidal maximum of 13.88 feet at The Battery in New York City Harbor. This historic event caused a number of city streets to be under chest-deep water in some areas and flooded tunnels and part of the subway system. During Superstorm Sandy, much of the Northeast experienced major flooding. Since there is a new moon occurring this week on August 11, those living near the coast might notice higher tides than usual this weekend. Although flooding likely won’t be an issue since no major storm is predicted to be moving through the region, high tide flooding (or “nuisance flooding”) has become increasingly common as sea levels continue to rise as a result of climate change. Both the loss of natural barriers along the shore as well as continued development along the coast has led to more instances of flooding during high tides in certain areas, particularly along the East Coast.